This beautifully conserved cruck-framed byre dwelling nestled in Glen Lochay offers a unique opportunity to visit a traditional rural home, virtually unchanged since its last inhabitant left in 1968. Inside, the family’s living quarters are separated from the cattle byre by a wooden partition. Unusually, it retains original features such as the hingin’ lum, box beds, Scotch dresser and layer upon layer of patterned wallpaper. The byre, once home to three milking cows, now displays some of the agricultural tools used on this farm. It also provides an excellent view of the cruck-frame construction and a glimpse of the original thatch under the tin roof. 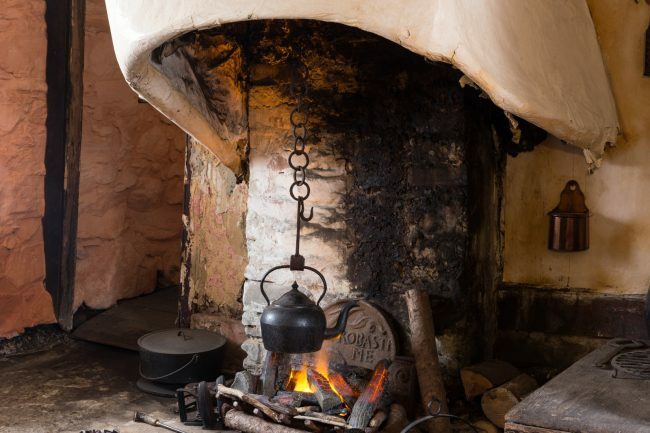 The old tin tool shed now holds an exhibition of many original artefacts from the house and byre, including rare examples of the family’s clothing discovered in the roof space above the house. A small but significant display of photographs and records reveal the changes throughout the 19th and 20th centuries to a once-thriving Gaelic community that has dwindled away.